Our landlord has agreed to renew our lease for another year. During that time, we are raising funds so we can move. Please spread the word, and sign up for a $10, $30, $60, or $80 monthly donation. We are Noisebridge. Noisebridge is a 5,200 square-foot, San Francisco hackerspace for technical-creative projects, doocratically run by everyone. We are a non-profit educational institution intended for public benefit. Everyone is welcome to use our many resources. Find others to create with, help with your projects & help others with their projects. Read more about Noisebridge or watch a short video. Noisebridge is facing displacement. 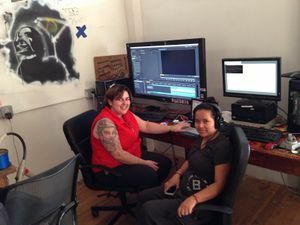 We are raising money on Patreon to meet our increased needs of $20,000 per month, to match operating expenses for a new space. Consider donating here. 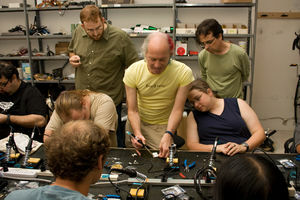 Anyone can participate in a class or workshop at Noisebridge! No membership or payment is required! Intro Poster: How we explain ourselves to new visitors. Resources: Stuff in the space -- computer network & servers, project areas, tools, bulk orders from Digikey/McMaster/Mouser. 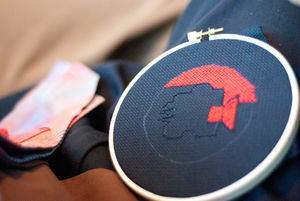 The Noisebridge Manual: A compendium of wiki knowledge detailing how Noisebridge works. Safety in the Space: What to do in case of an emergency. Press Coverage: mentions of Noisebridge in the media (both blog and dead tree). Identity: A collection of resources revolving around our identity and logo. Hosting an Event at Noisebridge: Suggestions on how to use Noisebridge for your event/class/workshop. 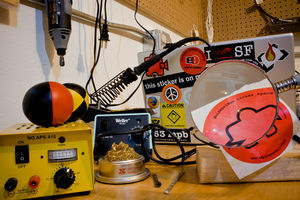 Hackerspace Infos: Howtos, Background, and friendly Hackerspaces elsewhere. Press: Please see our Press Kit - Includes press contacts, pictures, background info, etc. Or just drop by the space. New visitors should read up on getting in. Noisebridge grew out of Chaos Communications Camp in August, 2007. We have had regular weekly Tuesday meetings since September 2007. We rented our first physical space on September 1st 2008, which we quickly outgrew, and have been at our much larger 5,200 square-foot second location since September 1st 2009. 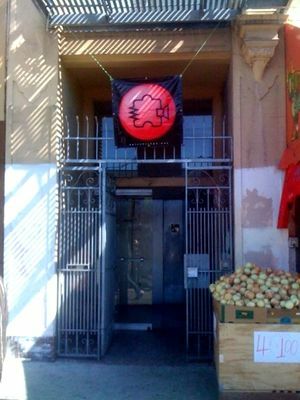 Noisebridge was granted tax-exempt 501(c)(3) status in July 2009, retroactive to October 2008. 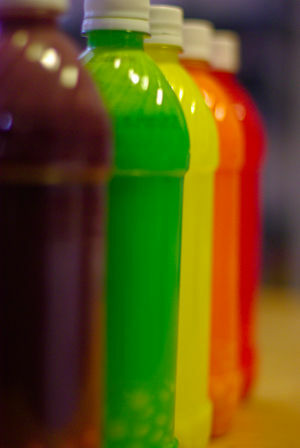 This page was last edited on 14 September 2018, at 21:09.